Fun and exciting places to play chess, if you dare! 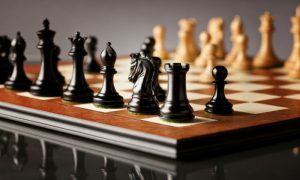 Chess is one of the longest existing board games, but also one of the most popular. People can get pretty serious about the game. Many people like to enjoy the game in a perfectly quiet and peaceful environment, while others can tune out the noise and chaos surrounding them. 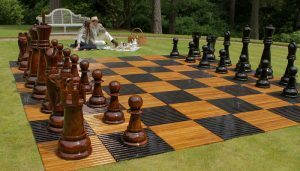 Chess games can be enjoyed in a wide variety of venues – at home, at work, school, or even in public parks. There are chess clubs that hold tournaments, and you can even play the game online. 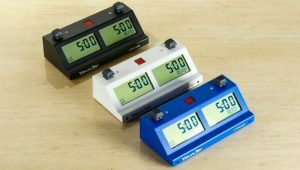 It’s not surprising that some people will try to take chess to the next level, whether that means playing multi-level chess games or taking their chess game on the road with them. 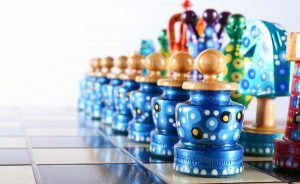 With magnetic chess sets being around for a few decades now, you can play your game almost anywhere without having to worry about your chess pieces toppling over. 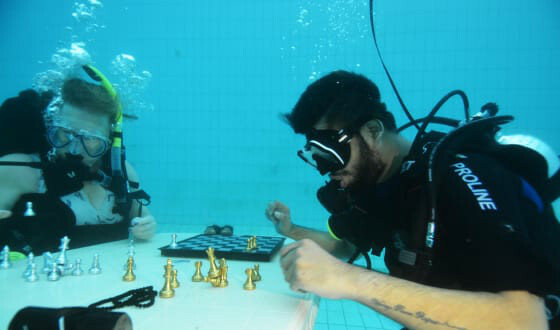 This sport combines diving with chess. It’s usually played inside a pool, though an ocean or a lake can offer its own unique set of challenges. It’s simple enough to bring your chess set for play in a pool, no diving equipment s even required. It’s a bit more difficult when the game is played beneath a deep pool of water that will require some additional illumination for everyone to be able to see the pieces. 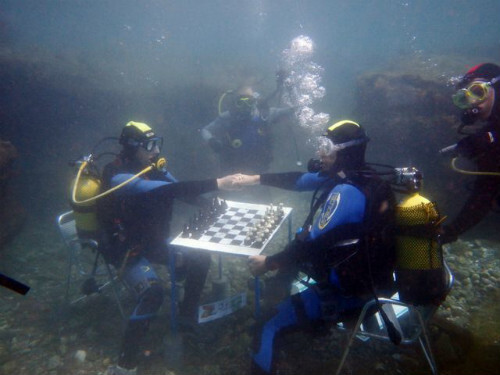 Two chess international masters, Hans Böhm and Robin Swinkels, had a game in the depths of Curacao’s sea. If you ever visit Motril, Spain, you’ll have your own opportunity for getting deeper into chess. Here you can suit up in full scuba gear and head to the bottom of the ocean. 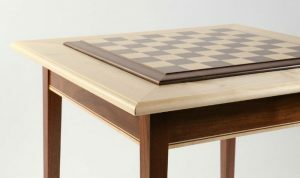 Down there, you’ll find a chess board waiting for you on a small table. They’ll even have two chairs and illumination set up so you can enjoy the game. Two chess international masters, Hans Böhm and Robin Swinkels, had a game in the depths of Curacao’s sea. There is even a recorded video where stingrays and other fish swim across the board.The sea creatures seem to be very interested in the game- at times they are so numerous that you can barely see the board! 2. On the International Space Station. Playing chess with lots of space takes on a whole new meaning here. 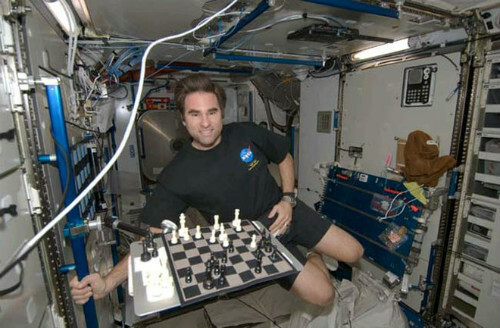 Greg Chamitoff played a game of chess during his time on the ISS. He was a Canadian astronaut and board game enthusiast. In 2008, when he orbited around the Earth, he’d play each round against grade-school students from around the planet. While his time was kept busy on the space station, he did make the time to play one move per day with the earthbound students. He even got to play an entire third grade championship team. While bringing the chess board along on your trip to Paris seems like a good idea, you’ll never be able to outdo this guy. In 1921, at the top of Eiffel Tower, Monsieur Eduard Pape climbed to the top of the structure and placed his chess board in a precarious position, complete with perfectly balanced chess pieces. 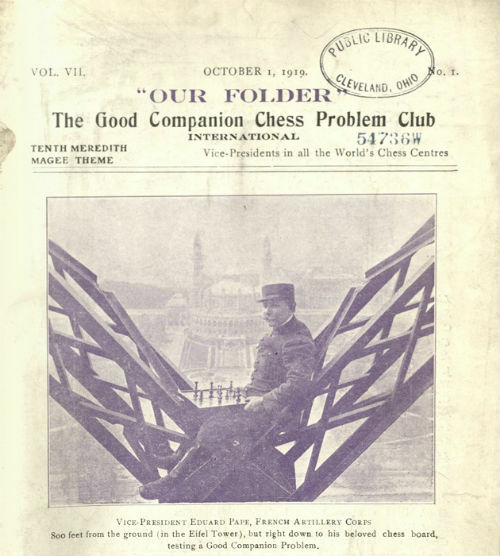 This vice president of the International Good Companion Chess Problem Club had climbed to a height of 800 feet in the air and played chess. This vice president of the International Good Companion Chess Problem Club had climbed to a height of 800 feet before settling down with his game. Now that should be an Olympic sport! The stunning photo was published in the American Chess Bulletin, and is still popular to this day. What makes his chess game so daring is that he’s not on the safe platform near the top of the tower, but outside and between two metal columns of the structure. While perched up there, he worked out a two-move chess puzzle that continues to challenge chess players today. These two guys had a game in the boxing ring, but instead of the usual punching match, it was a fight to the finish on the chess board. 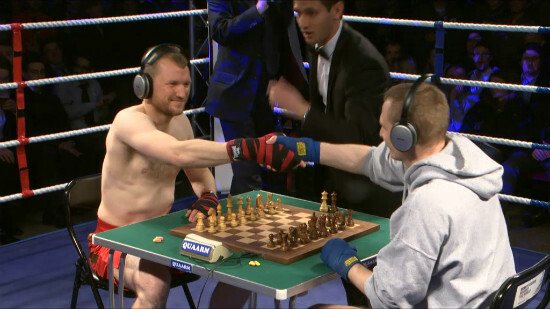 Apparently this is an event called Chess Boxing that combines strength of body with strength of mind. This isn’t something new either, it’s been done since the 1970s. But it has experienced a resurgence of popularity in the 2000s. There are even regular chess boxing matches held if you want do a search online for one in your region. Chess boxing has caught on primarily in Germany, USA, Russia, Iceland, the Netherlands, France, and India. Chess boxing involves a round of boxing followed by a round of chess, then another round of boxing, and so on. There is a short break between rounds, and both games are usually played in the middle of the ring. The only prerequisite to play are that both players must be thoroughly versed in boxing and chess, so they have a fair chance at winning. 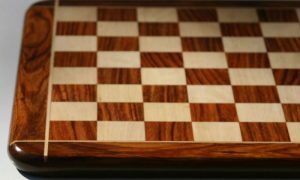 A match can be finished in a variety of ways- by your usual boxing knockout, resignation, stoppage by the referee, and by checkmate or clock flagging. If there is a draw in the boxing aspect, the winner may be determined by the score of the chess game, and vice versa. Each player must do one chess move per round and they are required to wear noise-blocking headphones to drown out any advice that may come from the audience. It’s one thing to focus on your chess game and another to maintain that focus when you’re on a ride that has many dips and turns. Of course, your magnetic chess set is going to help a bit. 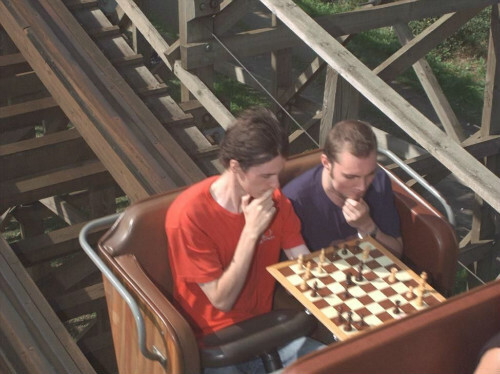 Chess game on a roller coaster ride began with an online meme and others thought it would be a good idea. It seems that this practice is becoming more popular on amusement park rides. However, many of these photos are fake, as the chess pieces have been glued down onto the boards beforehand. The goal is to get a photograph of yourself supposedly playing the game while plunging down a sharp hill or curve on the roller coaster. Apparently, this practice began with an online meme and others thought it would be a good idea. 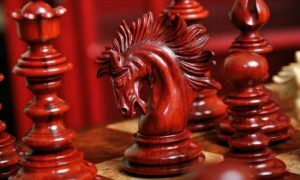 If you do want to play a game of chess in a crazy location, make sure you grab a proper travel chess set, rather than playing with a fake board. It’s your move.